Now you can Hibernate your Computer running Windows Operating System according to a defined Schedule. The Hibernate and Resume Action is fully customizable and can be done on a Daily basis. Just Add Action to Daily Hibernate Computer and then Add Resume Action to be performed at defined time. 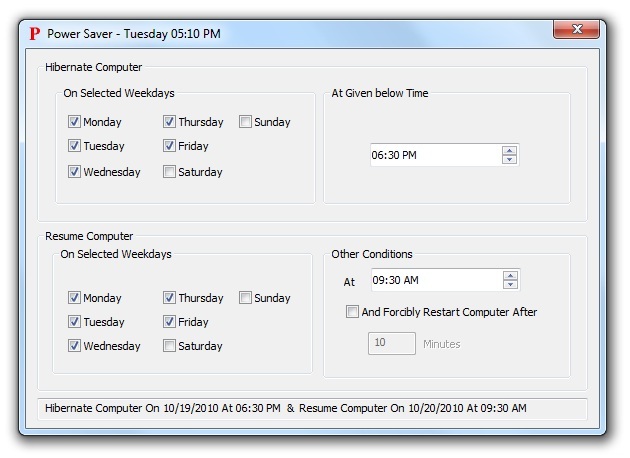 The Software Download also offers to Shutdown Computer or Restart Computer on a Daily or Weekly basis and you can select the Actions to be performed only on selected days by skipping some week days. Have a Look at the image on the left displaying Hibernate and Resume Actions added using Daily Actions Dialog Box. Download Software and Schedule Daily Hibernate and Resume Computer Control Actions. Given below procedure outlines how to Hibernate and Resume Computer Automatically by creating Actions to be executed Daily. Although this section describes only Hibernate and Resume Actions, other Computer Control Actions can be added to completely control your Computer's Power State. Download and install the Easy Shutdown Software Utility. Now Launch Easy Shutdown Utility from Desktop Shortcut or from Programs Menu. From the File Menu in the Main Application Window, select Daily Actions. Now navigate to the Drop List near Select Action, Select Hibernate Computer, Select the Time and click on Add Action button. Following the same procedure outlined above, add a daily action to Resume Computer. That's it, Now your Computer would be automatically sent into Hibernate Mode at selected time of the day and would Resume from Hibernation Mode at Selected Time. There is another software utility with which you can Hibernate and Resume Computer daily and skip any selected day. This Software utility can be useful for an unattended computer which can be sent into hibernation mode at let's say evening and can be resumed automatically in the morning next day. Download free trial of the software and hibernate your windows computer at configurable time and resume computer at configurable time. The Screenshot above displays a typical setting where a Windows computer is configured using Power Saver to hibernate in the evening on working days and the computer is confugured to resume from hibernate mode only on working days. Given below are few points to verify for successfully sending your Computer into Hibernation and then Resuming it Automatically. Run few tests before actually scheduling automatic hibernate and resume using the software download. Computer Hibernation must be enabled for this functionality to work successfully. In Order to Resume Computer, your Computer (Desktop or Laptop) must always be connected to AC power supply. Navigate to Easy Shutdown Home and read about Shutdown, Restart and other features provided by the software utility apart from Auto Hibernate and Resume feature.